As a toy photographer I draw inspiration and ideas from a variety of places and sources. Among those are certain movies and books, especially those that bring me back to my daughter’s childhood. Toy Story is one of those movies. I’ve watched the various Toy Story movies with my kid dozens of times, so it’s probably no surprise that when I began photographing toys in late 2015 I would naturally gravitate towards Toy Story. Like many toy photographers, I shoot a variety of toys – Star Wars, Marvel, etc. 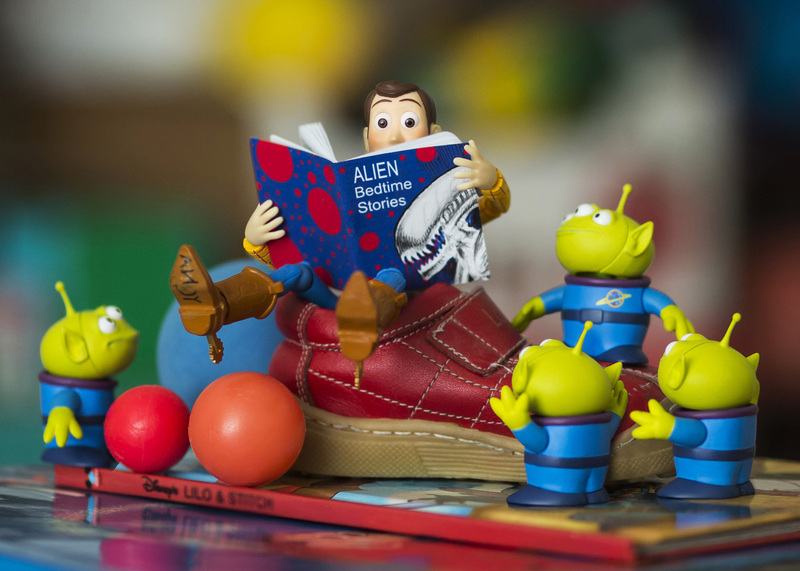 – but I definitely have an affinity for creating images around Toy Story. For this image I wanted a story that gave a glimpse into the personalities of the squeeze toy aliens. In the movie they are portrayed as passive, cultish beings waiting for the claw to take them to a better place. So it made sense to me that deep down they would enjoy hearing stories about other aliens that were aggressive and ferocious – something they could aspire to, at least in fantasy. The setup was pretty straight forward. I wanted to find or create a location that was very colorful, as if taking place in Andy’s room among other toys. I ended up creating the scene in my office, in front of some book shelves that were full of colorful props and toys. Some time ago I created a very simple adjustable platform that can be raised to different heights for setups like this. It’s a piece of wood that screws onto a cheap light stand. Once secured it can be raised or lowered as needed. The shelf full of toys that I wanted as my background is around 4 feet off the ground, so I just raised the platform to that height and was ready to go. A little note on the red baby shoe Woody is sitting in – that’s my daughter Angie’s baby shoe. She turned 17 in February and I’ve been feeling nostalgic ever since. Here’s another image showing the complete stand. 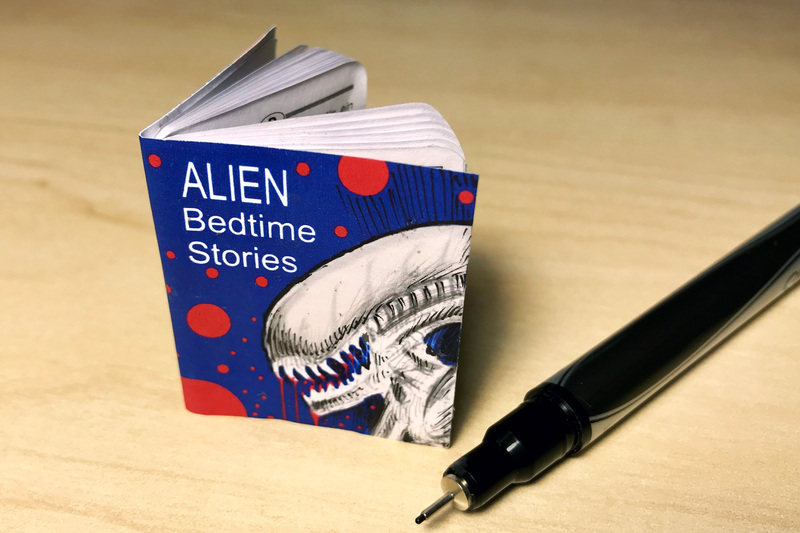 Lastly, I needed to create the tiny book that Woody would be reading to the aliens. I did this by designing and drawing the book cover in Photoshop, printing it out to size, and pasting it onto a small random instruction booklet I had lying around (which I cut to a more appropriate size for Woody). 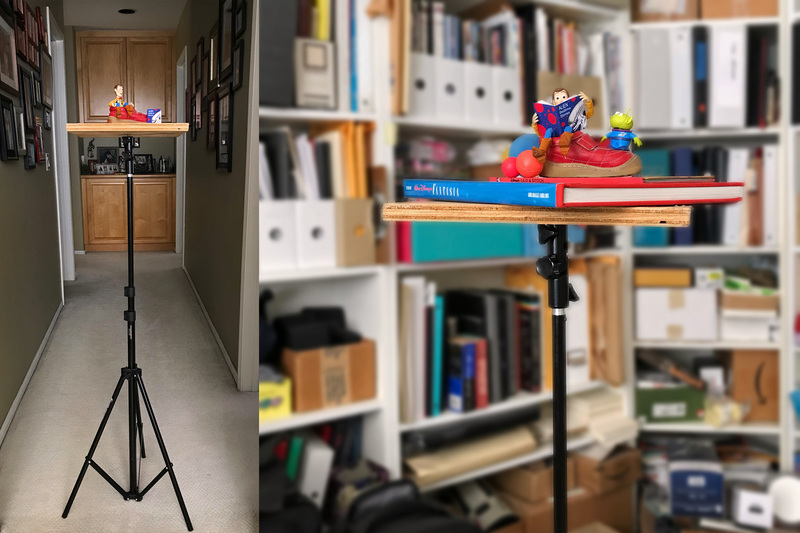 A big part of my toy photography is problem solving, and it took me a little while to figure out the best way to create this book. Using the instruction booklet was perfect as it had all the pages already – something I felt was critical to making the book believable. Equipment Used: Canon 5D Mark III with the Canon 135mm f2L lens, shot at f/2. ISO 640, 1/640 sec. My office window faces west and is flooded with light in the afternoon, so natural light was all that was required. Thanks, Dave. I don’t make a lot of my own props – I didn’t do well in wood shop as a kid haha! But I have sculpted my own props and characters which I really enjoy. Such a wonderful glimpse behind the scenes. Thanks for sharing this with us Mitchel. The DIY adjustable platform is genius! So many times I’ll have toys balancing precariously on stacks of boxes and books to get them to the right height I need for a shot. Your platform has got me inspired to DIY my own version. And the 17 year old shoe is a lovely touch! Thanks a lot Brett! That adjustable platform has been a minor game changer for me…very useful! If I was handier (see above comment to Dave about my poor wood shop skills!) I would use a sturdier method to secure the wood to the light stand, it’s a tad wobbly just using the one screw on the stand to secure it. But it’s compact enough that you can bring it outdoors and use it on location…which could be useful in keeping you from laying on the ground if desired. Just build your little set on the platform and use nature or whatever landscape as your background. If you come up with a better method of making the stand please share! So cool, we have a platform like yours we use for wine bottle photography, I never thought of using it as a little platform for my toy photos… I shall now endeavour to try just that! Thanks for the behind the scenes view of your set up and thought process. I love that the book for the cute aliens has the scary alien on the cover, a very nice touch. Thanks for the feedback Tyroga, really appreciate it! Wine bottle photography sounds fun (if the bottles are full when received, and yours when the shoot is done!)! You have just saved an old light stand from going to the tip. Thank you for the idea.